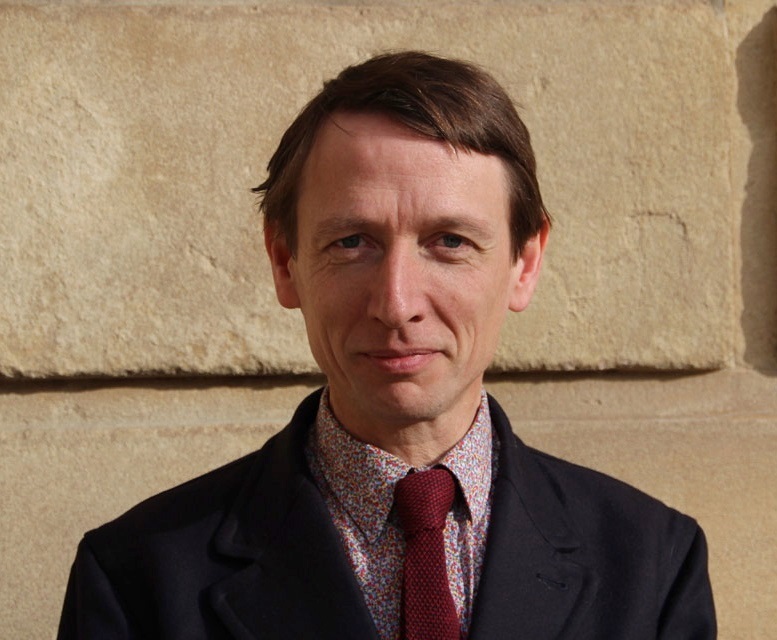 It was quite apt that Alexander Sturgis, Director of the Ashmolean Museum, in Oxford, should begin his talk on May 6th with a magic trick before discussing the strategies that artists use to deceive the eye. Alexander, an accomplished magician performing under the name The Great Xa, tore up a copy of The Sun newspaper and then - through the power of illusion - appeared to bring it back again, completely intact. Alexander explored several aspects of the ways in which artists perform deception, including the trompe l'oeil of Flemish masters, such as Cornelis Norbertus Gysbrechts, who also specialised in still-life to trick contemporary viewers into believing that the painted, two-dimensional illusions were real three-dimensional objects. Forced perspective is a comparable illusion in architecture and, in more recent times, Gavin Turk exhibited a piece which appears to be a standard black bin-bag but, on closer inspection, it is actually cast in bronze - showing how illusion can elevate the banal and give it longevity. Although the phrase trompe l'oeil originated in the Baroque, when it refers to perspective illusionism, Alexander told us the concept dates much further back and was often employed in murals, with examples found in Greek times and also at Roman Pompeii. He recounted the story of the contest between two renowned Ancient Greek painters - Zeuxis, who produced a still-life painting so convincing that birds flew down to peck at the painted grapes. His rival, called Parrhasius, asked Zeuxis to judge one of his paintings that was behind a pair of tattered curtains in his study. Parrhasius asked Zeuxis to pull back the curtains, but Zeuxis found he could not as the curtains were included in Parrhasius's painting....making Parrhasius the winner. The Dutch painter Samuel Dirksz van Hoogstraten was also a master of trompe-l'œil and wrote about the role of art as the life-like imitation of nature and he was especially skillful in his trompe l'oeil still-lifes, where the reality of a scene of apparently haphazard objects often has deeper meanings. 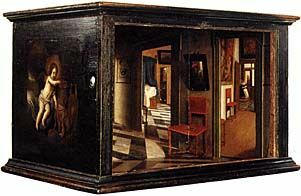 Alexander said Van Hoogstraten also employed his skill with perspective to construct "peepshows" or "perspective boxes", such as A Peepshow with Views of the Interior of a Dutch House - which is a box with convincing 3D views of the interior of a Dutch house when viewed through peepholes on either end of the box. Trompe-l'œil can also be found painted on tables and other items of furniture, on which a deck of playing-cards might appear to be sitting on the table - with a particularly impressive example at Chatsworth, in Derbyshire, where one of the internal doors appears to have a violin and bow suspended from it in a trompe l'œil painted around 1723. 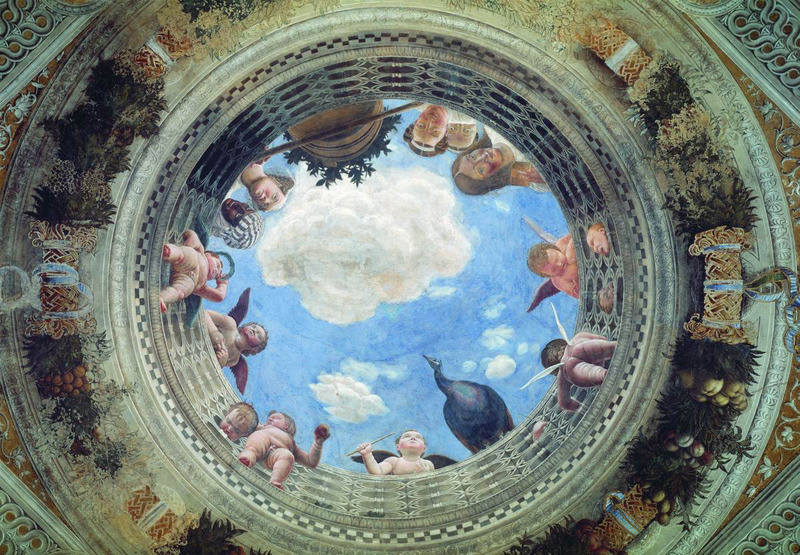 Earlier, added Alexander, there had been fascination with perspective drawing in the Renaissance when Italian painters such as Andrea Mantegna and Melozzo da Farli began painting illusionist ceiling paintings, generally in fresco, which created the impression of greater space for the viewer below. Well-known examples of this trompe l'œil illusionism are the Camera degli Sposi in Mantua and Antonio da Correggio's Assumption of the Virgin in the Duomo of Parma. Similarly, Vittorio Carpaccio and Jacop de'Barbari added small trompe-l'œil features to their paintings, exploring the boundary between image and reality - such as a fly apparently sitting on the painting's frame, or a curtain appearing to partly conceal the painting. Similarly, a piece of paper might seem to be attached to a board, or a person might appear to be climbing out of the painting altogether - all in reference to the contest between Zeuxis and Parrhasius. Perspective theories in the 17th Century allowed a more fully integrated approach to architectural illusion to "open up" the space of a wall.. 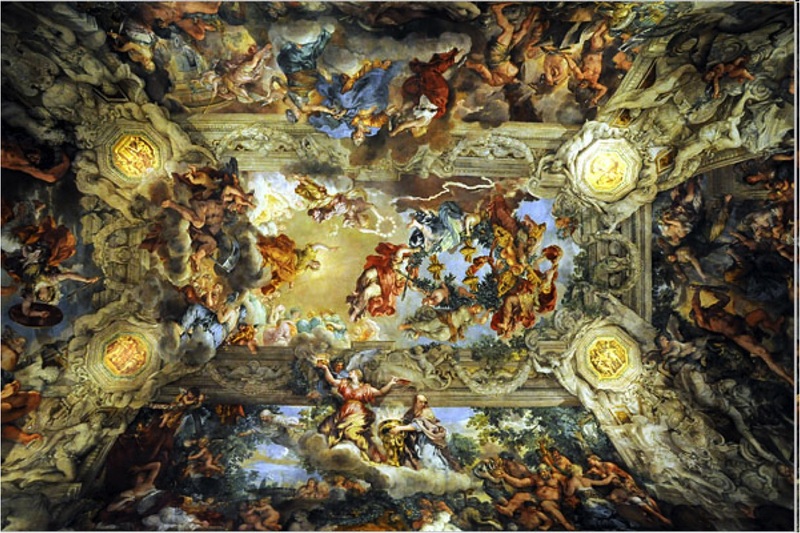 Examples include Pietro da Cortona's Allegory of Divine Providence in the Palazzo Barberini and Andrea Pozzo's Apotheosis of St Ignatius on the ceiling of the Roman church of Sant'IgnazioAnd the interiors of Jesuit churches in the 16th and 17th century often included such trompe-l'œil ceiling paintings, which optically "open" the ceiling or dome to the heavens with a depiction of a saint's ascension or assumption. Alexander also explored another aspect of illusion - the waxwork - noting the more recent trend of people being photographed close to a replica, such as teenage girls kissing a sculpture of Justin Bieber. 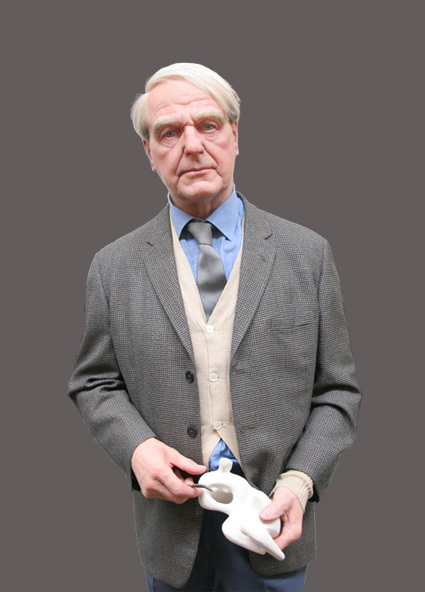 He highlighted waxworks of David Hockney and Henry Moore - the latter made for Madame Tussauds in 1995 and restored at the Holburne Museum in Bath, where Alexander was previously Director. He pointed out that waxwork portraits have to be maintained, so they have as much impact as when first created - although he claimed that the illusion of reality is quickly broken when viewing them close-up. Over 130 people filled the hall on a warm spring evening - when a highly informative and entertaining talk and perfect weather combined to create such a memorable event.